Preheat oven to 200°C/390°F. Cut off the ends of a sweet potato. 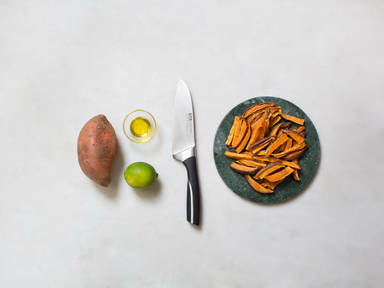 Cut a thin slice off of one side to form a base for safe cutting, then cut into thick fries. Transfer sticks to a bowl and season with salt, pepper, and olive oil. Coat thoroughly. Transfer the fries to a parchment paper lined oven rack and spread out into an even layer. Bake at 200°C/390°F. for approx. 40 - 50 min. or until golden brown. For the dipping sauce, add crème fraîche and lime juice to a small bowl. Season with salt, chili flakes, and olive oil. Chop some parsley and basil and add to the dipping sauce. Mix to combine. Serve hot fries with dipping sauce and enjoy! Finely chop parsley and basil. Add them to the sauce. Mix well to combine. Remove the fries from the oven, season with salt, and enjoy with the dipping sauce.